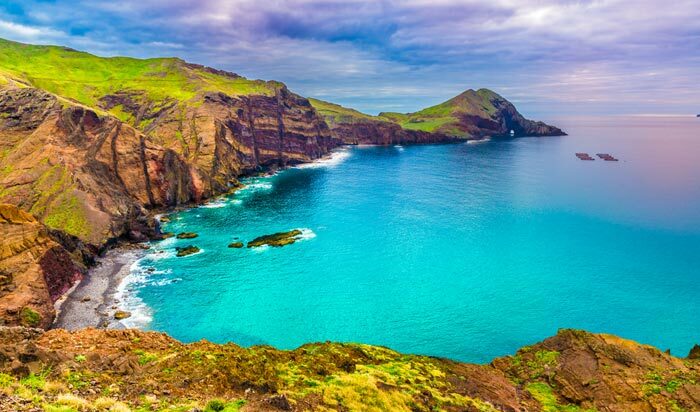 Madeira’s warm Mediterranean climate makes this a great destination for beach holidays, yet this archipelago of four islands off the coast of Portugal is far from being just another beach destination. 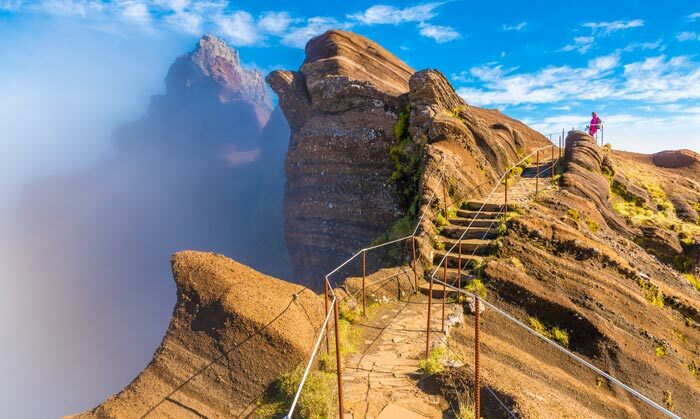 Full of breathtaking scenery, Madeira has amazing hiking opportunities across striking and sometimes rugged landscapes, or, if hiking is too much you can take a leisurely stroll through attractive gardens. 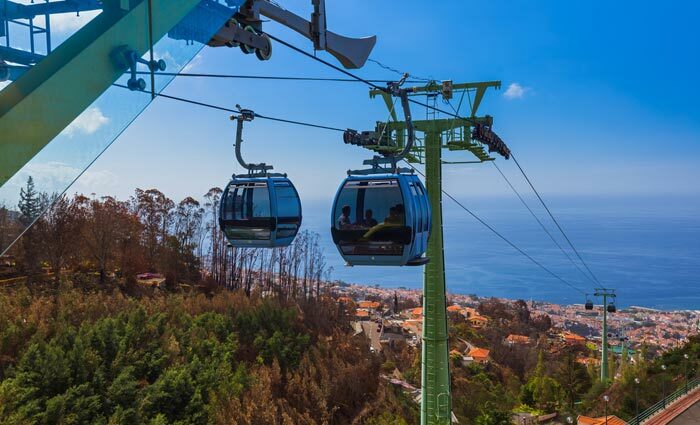 Known for its numerous cable cars, no trip to Madeira is complete without taking at least one cable car ride, and it’s rich in culture too! 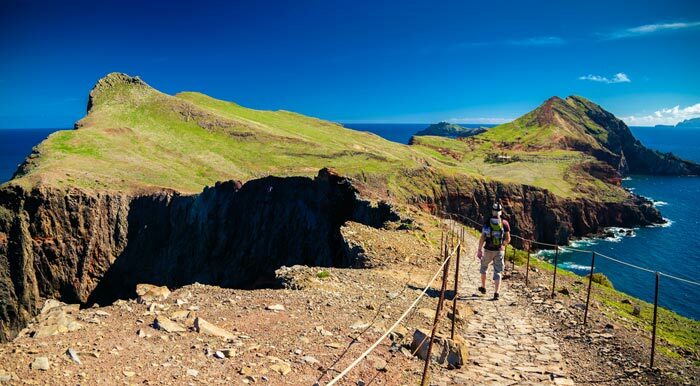 Our top 10 things to do in Madeira gives you all the details of the islands’ best attractions. Near the heart of Funchal and just a short walk from the cruise ship dock is the lovely Santa Caterina Park. 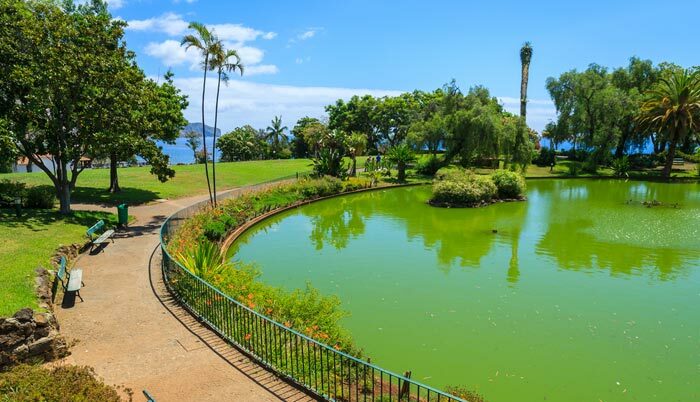 One of the largest parks in Funchal, it sits elevated above the water and is reached via a set of steps, but, like many other places in Madeira, the views are well worth the short climb. The park is a very pleasant place for walk and is centered around a small lake plus there’s a historic chapel that originally dated from the 1400s and was rebuilt in the 1600s. Statues and aviaries add to the interest, while on a hot day, this Madeira attraction provides nice places to sit in the shade. 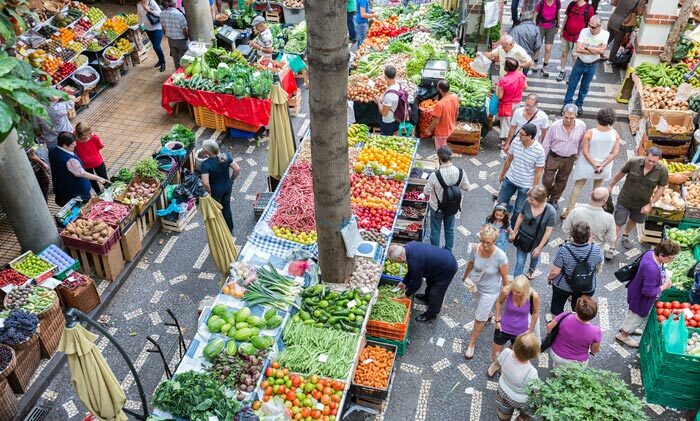 Still frequented by locals, Mercado dos Lavradores (meaning Workers Market) is a great place to spend some time among local people, soaking in the atmosphere of this popular and vibrant market. Unique aromas will fill your nose, while exotic colors draw your eyes in this, Funchal’s main market that was built in 1940. Much of the original art deco structure is still intact today so it’s interesting from an architectural point of view too. Browse for fresh vegetables and fruits, fresh fish, exotic flowers, meats, and spices. Far from being a tourist trap, this market should definitely be on your list of things to do in Madeira. Known for being very sweet, fortified Madeira wine is famous around the world, but it’s not just a sweet wine. There are dry varieties too which you should sample while visiting the island. For cuisine, fish is very popular on restaurant menus and there’s always an abundance of different kinds including types of tuna and marlin. Other traditional Madeiran dishes include Milho Frito and Espetada, while there are many sweet treats for desserts such as Honey Cake (Bolo de Mel). 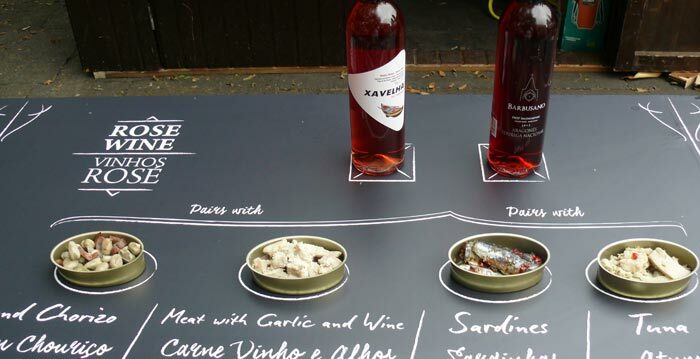 Be sure to add Madeiran cuisine to your list of what to do in Madeira. Valley of the Nuns (Curral das Freiras) is a scenic valley situated in the mountainous interior of Madeira that is home to a small village set in the crater of a now extinct volcano. 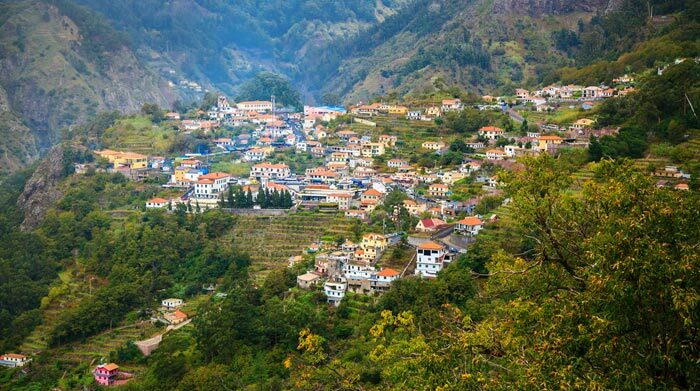 As well as the beautiful scenery, the Valley of the Nuns is a top Madeira attraction because of the small village and its quaint, untouched charm that will take you back several hundred years. The 16th century Santa Clara convent is where the nuns used to hide to evade pirates attacking nearby Funchal, and there are nice cafes if you’d like to stop a while. 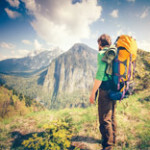 For a longer visit, try some of the surrounding hiking trails. Anyone who has visited Faja dos Padres will tell you this is one of the best things to see in Madeira even though it’s a little off the beaten tourist path. Take the cable car down the side of a sheer cliff face to a special little oasis below where you’ll find a quiet beach and a beachside restaurant. This is the perfect place to rub shoulders with locals and try the tasty local cuisine that consists of fresh fish and fresh local vegetables, some of which are grown right here. If you’d like to buy vegetables to take back with you, there’s also a little market garden. 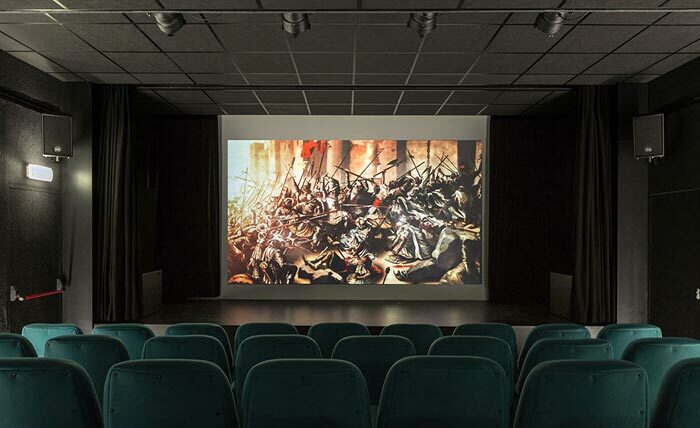 From the name of this Madeira attraction you may think it’s a cinema or a museum about the history of film; in fact, it’s a film about the history of Madeira! The 30-minute film is a great way to discover the history and culture of the island over the past 600 years. It may be a slightly condensed version, but if you’re pushed for time and are interested in learning more about Madeira, this is a great way to do it and is likely to hold the attention of children better than a stuffy museum might! The film airs throughout the day, with a 15-minute break between each show. 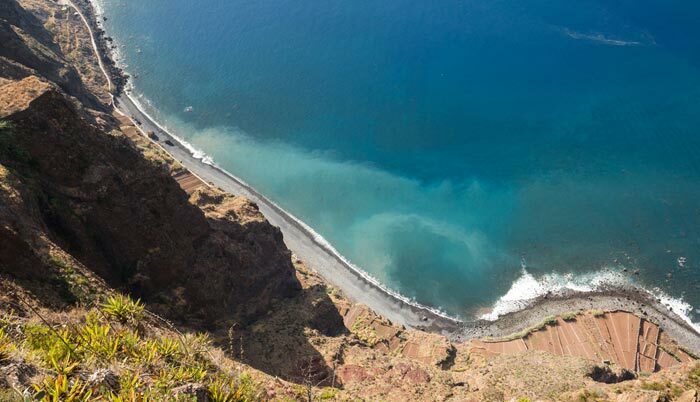 Marking the farthest eastern point on Madeira, Ponta de Sao Lourenco makes our list of what to do in Madeira because of its spectacular scenery. You can catch a bus, or drive up to the end of the road, but for the best vistas be sure to walk towards the end of this peninsula. If you’re taking your time and stopping at the various viewpoints – which you should definitely do – it will take between 2 and 3 hours to walk out to the farthest point and back. 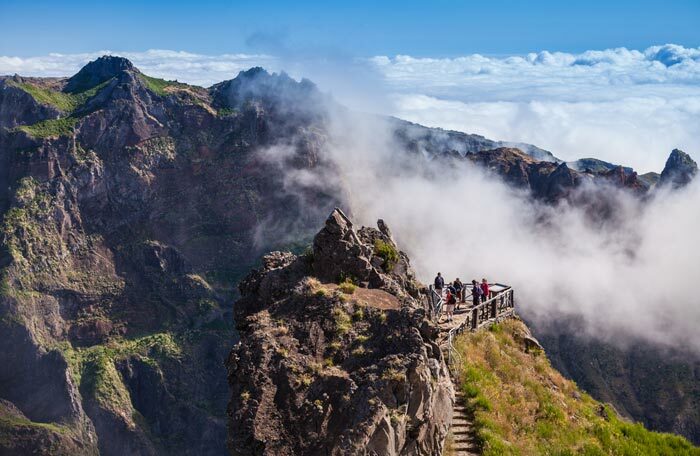 The third highest peak on Madeira, Pico do Areiro stands 1818 meters (5965 feet) high and is easily accessible by road, so you don’t need to be an extreme hiker to get here! From the summit you’ll enjoy amazing views on a clear day, and when it’s cloudy you’ll usually be standing above the clouds. 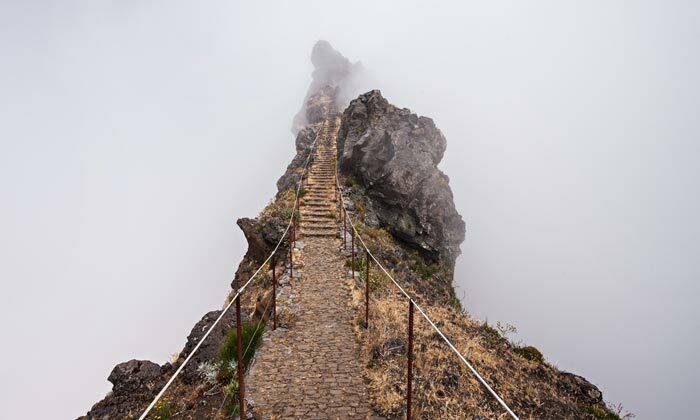 The scenery is rugged yet beautiful, making this a top thing to do in Madeira. And, if you want to explore the island’s peaks some more, take the strenuous hike across to Pico Ruivo, the highest point on Madeira. Not for the uninitiated hiker, this trail is quite difficult and made more difficult by changing weather conditions. Do not miss the Madeira Botanical Garden cable car just because you think it will be the same as any others on the island! It’s equally spectacular for different reasons. Accessible after a very short walk from the top of the Monte cable car, this one takes a spectacular route across a deep ravine to the island’s botanical gardens, and then rewards you with a different view of Funchal. The gardens are lovely and well laid out, plus there are several hidden gems to look out for such as The Lover’s Cave, and be sure to see the Louro Bird Park as well. 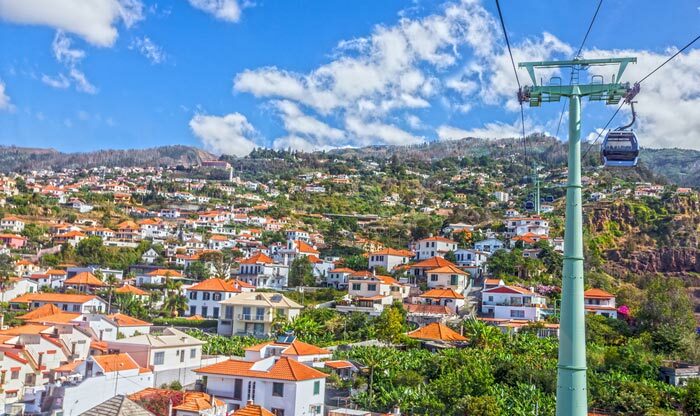 A suburb of Funchal, Monte is home to the best-known cable car in Madeira and is one of the most popular Madeira attractions. Get whisked up the hill to Monte on the cable car, a journey of around 15 minutes. Enjoy the views as you go, and some even better views from the top where you can decide on what you’d like to do next. There’s Monte Palace with its beautiful tropical gardens and art museum, a pretty church, and some nice restaurants, and when it’s time to leave, speed back down the hill on a toboggan!